Shannon McCarthy | ADOT&PF Jun 1, 2018. 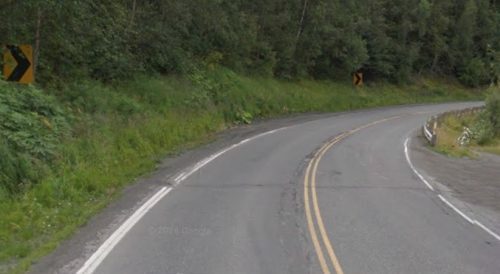 The Sterling Highway near Cooper Landing is a narrow, winding stretch of highway in need of upgrade. The ROD formally selects the Juneau Creek Alternative as the preferred alternative for the project. The Juneau Creek Alternative provides the best balance between meeting the project needs and minimizing impacts to the human and natural environment. Built in the 1940s and 1950s, the Sterling Highway has remained essentially the same through Cooper Landing. This section is not adequate to serve the current volume of traffic, doesn’t meet modern highway design standards, and has safety concerns. The ROD signing marks decades of work by FHWA and Alaska Department of Transportation & Public Facilities (DOT&PF) to select a new highway route through one of the toughest terrains and richest ecologies in the nation. The ROD is an accomplishment for FHWA, DOT&PF and the project team who have worked to bring needed improvements to this section of the Sterling Highway. DOT&PF first looked at improving this area in the late 1970s, even completing upgrades to MP 37-45 in 2001. But the more complicated section, MP 45-60, has waited until today to move forward. The project was particularly challenging to develop due to its proximity to the Kenai River and Lake, Kenai National Wildlife Refuge, Resurrection Pass National Recreation Trail, coupled with steep terrain, nearby historic and cultural resource sites, and limited right of way. The signing of the ROD allows DOT&PF to begin design and renews a robust public involvement process.